Zinnia is a genus of annuals and perennials consisting of about 20 different species. They are native to North, Central and South America and are commonly grown for their ornamental flowers. They can reach up to 3 feet in height and are usually grown as annuals in temperate climates. However, zinnia flowers will reseed at the end of the year, allowing new plants to grow the following season. 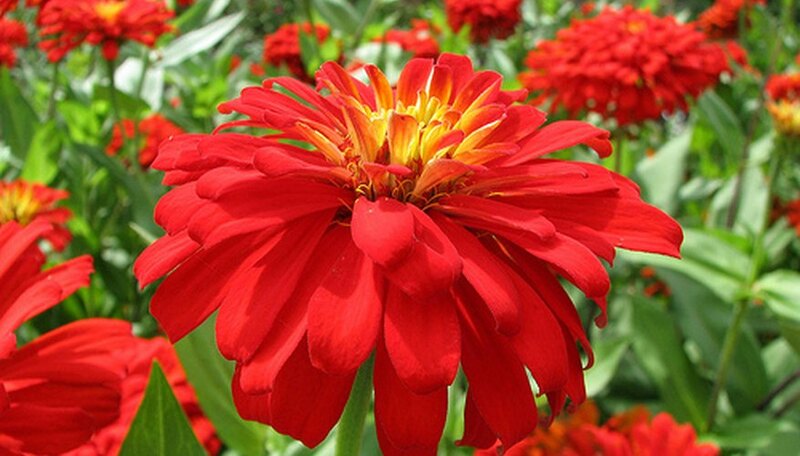 Zinnia flowers are large and showy, and can be orange, red, bronze, pink, white or green in color. They are easily grown in both temperate and tropical regions with only minimal care. Plant zinnia seeds outdoors after the final frost of winter. Choose a location that receives full sunlight and does not block the wind, as poor circulation can result in fungal infestations. Spread a 1-inch layer of organic compost over the planting site one week prior to sowing to increase fertility. Sow zinnia seeds two to three inches deep in the planting area. Allow between 6 and 18 inches between each zinnia to allow plenty of room for growth and alleviate competition for nutrients. Water the seeds thoroughly to compact the soil and initiate growth. Water zinnia flowers about twice per week, or frequently enough to keep the soil relatively moist. The soil should be allowed to dry slightly between applications. Do not splash water on the leaves of the plant while watering, as moist foliage encourages the growth of diseases. Feed zinnia flowers once per month using a balanced 10-10-10 NPK fertilizer. Water the soil before and after applying to prevent root burn. Follow the manufacturer's instructions for proper dosage and application directions. Remove flowers as they fade and die to force zinnias to form additional flowers as opposed to seeds. Pinch off the blossoms as close to the stem as possible. Prune damaged or dead foliage as well, as the plant will waste nutrients trying to revitalize the wounded leaves. The organic compost does not need to be manually incorporated into the soil. Over the course of the week, it will naturally decompose and add nutrients to the soil. A spade or garden tiller can be used if zinnia flowers must be planted immediately. Sow additional zinnia crops once per month until mid-summer for blooming all season. How Long Do Zinnias Take to Flower?